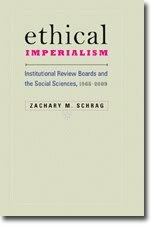 Joy Rohde, assistant professor of history at Trinity University, reviews Ethical Imperialism for the Journal of American History and finds it "a valuable contribution to the history of federal science policy and a useful critique of a system ill-suited to the uses to which it is being put." Schrag's evidence leaves no doubt. Federal commissions repeatedly failed to recognize important distinctions between the methods and subjects of biomedical and psychological research and those of the social sciences. In some cases, like that of the Belmont Report (1978), policy makers failed to seek appropriate outside advice from qualified researchers. In others, such as that of the National Commission for the Protection of Human Subjects of Biomedical and Behavioral Research (1974–1978), policy makers listened to input from social scientists, yet inexplicably wrote rules that papered over difficult disciplinary and ethical distinctions. Rohde does find that "Schrag's evidence also indicates that social scientists’ plight might be, in part, their own doing. Social scientists have repeatedly failed to reach consensus within their own disciplines about the ethical limits of methods such as deception, the ethical threats posed by certain forms of research sponsorship, and the abilities of their own professional associations to serve as ethics police forces." This is a good description of the 1990s, but in the 1960s and 1970s, social scientists achieved a remarkable consensus about IRBs. Here's hoping the 2010s will reprise those earlier efforts.